Chocolate and nuts are a perfect marriage in my opinion, and Divine Chocolates seem to think so too. 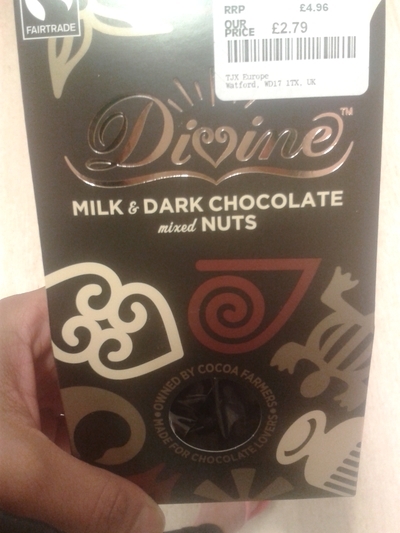 I picked up a box of Divine Milk and Dark Chocolate covered Nuts (£5.00) in TK Maxx, on a recent shopping trip. I couldn't help but buy them - I love chocolate, and I love nuts. I've enjoyed chocolate covered nuts many times in the past, but they're not always up to scratch. Sometimes the nuts aren't completely coated in chocolate, which I think is a bit of a cop out, when it's what you're paying for. These Divine ones, are thankfully, completely covered in Divine dark and milk chocolate. They are yummy, and because they're all natural, it makes eating chocolate less-naughty, plus they're mostly nuts, so it's a healthier option if you're watching your diet. You can buy these for £3.00, if you're a savvy shopper. If you can't get these online, or you don't have a TK Maxx nearby, try Selfridges Food Hall, WholeFoods, or Amazon, and you'll be able to enjoy nutty heaven.